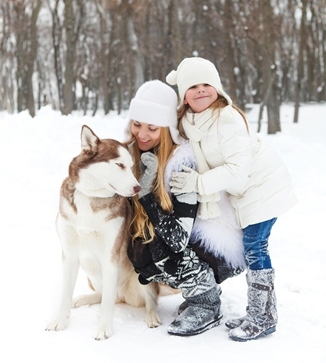 15 winter safety tips for your dog! Many dog owners live with the misconception that because their pets have a coat of fur, they can tolerate the cold better than humans. This isn’t necessarily the case. Like us, these fur coated creatures are used to the warmth of indoor shelter and cold weather can be as hard on them as it is on us humans. We have 5 winter care tips for you to keep in mind as you explore the winter landscape with your faithful four-legged friend. If your dog feels the cold, try to walk him in the late morning or early afternoon hours when temperatures are little warmer. Spend time playing outdoors while it’s sunny. Our family pets need to be indoors with us. The happiest dogs are taken out frequently for walks and exercise but live inside the rest of the time. Don’t leave pets outdoors when the temperature drops. Some dogs breeds are blessed with thick fur that keeps them warm naturally, even in very cold temperatures, but dogs with thin coats may need to wear a sweater or coat when out for winter walks. A good coat should reach from the neck to the base of the tail and also protect the belly. 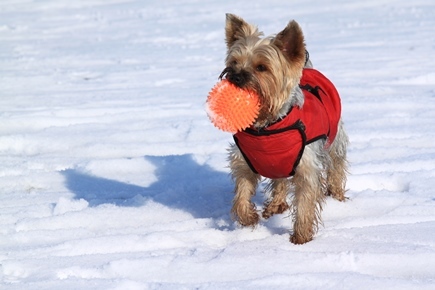 It’s important to remember that coats will not prevent frostbite on the ears, feet or tail. 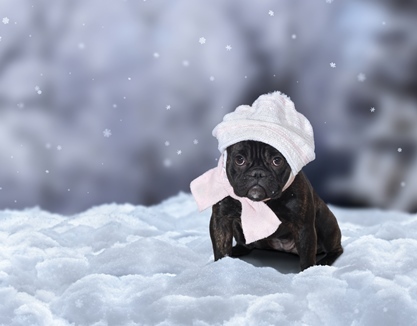 Read More: Protect your pet when the temperature drops! In addition to limiting your dog’s time outdoors on cold days, don’t let your pooch sleep on a cold floor in winter. Choosing the right bedding is vital to ensure your dog stays warm. Warm blankets can create a snug environment. Place your dog’s bed in a warm spot away from draft, cold tiles or uncarpeted floors. Dogs will often seek heat during cold winter weather by snuggling too close to heating sources. Avoid space heaters and install baseboard radiator covers to avoid your pet getting burned. Fireplaces also pose a major threat so make sure you have a pet proof system to keep you heat-seeking pet out of harm’s way. Paying special attention to your loyal friend’s wellbeing during the winter season will insure that you both enjoy the season to the fullest. At Discount Insurance we know you care about your faithful companions, our Pet Insurance helps you provide them with the best care possible in the event of injury or illness.